Suggestions for best viewing on monitors..
Folks, this is a long piece but I believe, a good one. Obviously, you will be the judge of that. If you're curious about Rendlesham (1980) and you have patience to go through it as I have, I suspect this is probably a must read. For me, what I learned from this investigation in the last six months was more interesting than I ever could have imagined. For those interested in analyzing this case in-depth, this on-line rendition will be much easier to cross-check than anything most people could probably achieve in a standard book. Many of the internal links are redundant just to help people either instantly retrieve earlier points or check the veracity and/or accuracy of things I've said. I don't expect you to access all the URLs, but some are there simply for an instant replay of various issues in the proceedings if needed. It is definitely important for one to realize that when I started my research into this, I honestly had no idea which way it was going to go. As it turned out, it necessarily wound up becoming a critique of The Rendlesham Forest UFO case by Ian Ridpath, located at http://www.ianridpath.com/ufo/rendlesham.htm. Ian has been thought by a number of people to have written the definitive, scientific piece on this topic. Although I didn't expect it, what I discovered for myself and have laboriously toiled to display for you here will hopefully demonstrate beyond reasonable doubt that, as impressive-looking as Ian's website is, his on-line rendition concerning Rendlesham may not actually be as definitive as is presently thought. It is as much a surprise to me as to anyone else reading this. Another reason I'm putting it on-line is because I believe it clearly and thoroughly explains why Halt, Burroughs, and Penniston were included in the prestigious international group of people who testified concerning their specific UFO experiences at the National Press Club conference in Washington DC, November 12, 2007. It also explains why a number of researchers haven't been able to fully agree with Ian's solution for Rendlesham in all this time. A link to the aforementioned conference has been provided at the end of this piece. At the outset, it is necessary to say it is a pleasure to note the time and hard work which Ian, David Clarke, James Easton, Peter Brooksmith, Jenny Randles, Tim Printy, Georgina Bruni, Robert Hastings and others had put toward their investigations into Rendlesham. I am truly thankful for their diligent work. In particular, one can note the amount of honest thought and obvious effort and expense which went into Ian's presentation concerning same. His website's layout makes it very easy for other researchers to read and analyze. Therefore, nothing I am about to say diminishes in any way my respect for what he and others have accomplished in this regard. As a matter of fact, my own fact gathering and analysis for this piece probably would not have been totally possible without the excellent foundation Ian laid for us, including the impressive linking and data he presented. That being said, the majority of what you are about to read will be the displaying of a number of items of agreement and disagreement between Ian's thinking and my own. Also included is my additional analysis of certain testimonial data which, as far as I can see, seems to have taken second place in Ian's investigation. When the result of that analysis is given its due, contrary to Ian's on-line presentation, I believe it is possible for others to conclude the summation of those testimonies points to an excellent chance one or more UFOs were present at Bentwaters/Rendlesham in December 1980. 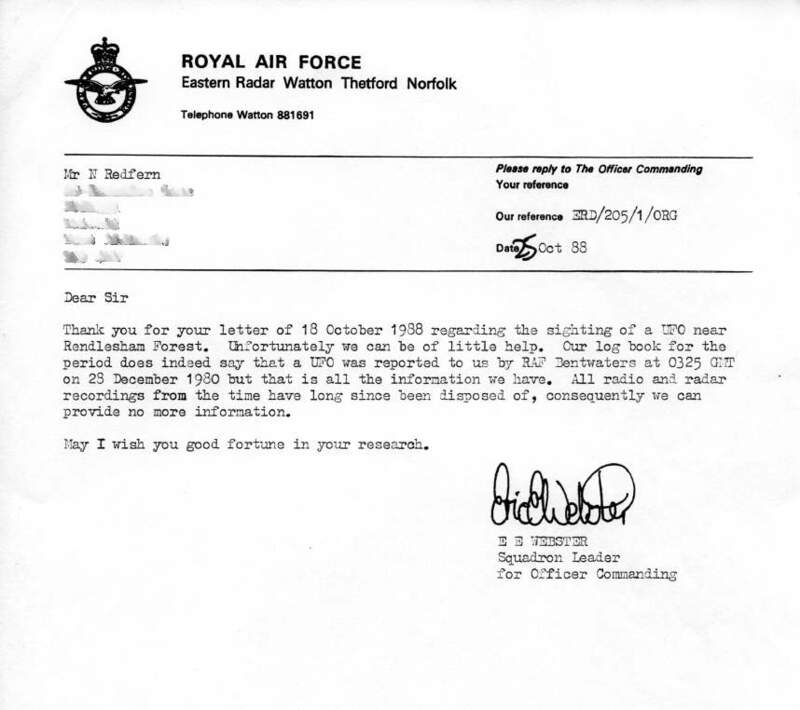 Having had an email discussion concerning Colonel Halt's radiation readings which were taken at Rendlesham, and having it pointed out that what I thought about it was incorrect, I came face to face with the reality that Halt's actual readings did not agree with what Nick Pope had been stating concerning them. Attempting to find a reason for this discrepancy, I searched the internet and came upon Ian Ridpath's website (URLed in my opening paragraph). A number of individuals had contributed to the totality of it. Although I didn't get my answer, information at Ian's website impressed me enough to get me to ask myself if I had been wrong in what I had been thinking all along concerning the Rendlesham case as a whole. Was it possible Colonel Halt and the witnesses really were all just simple victims of coincidence; i.e. had they merely been misidentifiers of normal astronomical phenomena and a lighthouse? It was clear, in order to find an answer for myself, I was going to have to review the whole thing. I knew it was going to be one heck of a chore, considering all the people who had already studied it. I might add that at that time, I was even personally leaning toward what Ian had to say about it. However, as I was painstakingly examining case details pursuant to this end, I happened to notice some errors that Ian had made and some interesting issues both within those witness testimonies and within Ian's explanations for them. What I eventually discovered was that Ian's explanations, rather than solving those issues, generated a number of additional intriguing questions. It was to my great surprise that the answers to some of those questions began revealing a side to Rendlesham/Bentwaters which I could see Ian had missed. I began realizing that although Ian may have been right concerning parts of this case, his presentation had a couple of weaknesses which seemed to indicate it was likely he wasn't right about all of it. What follows are my thought processes during this endeavor. Here I was expecting Halt's testimony to fall completely apart and yet, with each step I was beginning to realize some of it actually had both a certain solidity, and congruency to the other testimonies. Various discoveries and accrued bits of information kept pushing me further away from what I first thought were Ian's well-constructed conclusions. I guess it had to do with where I began my analysis as opposed to where Ian began his. To put it in my own words, Ian's summation of the case said . . . the airmen had seen a meteor coming down which caused them to think something had crashed into the forest. Compounding this, those airmen had misidentified the blinking lighthouse as a UFO due to the fact that lighthouse was approximately in-line with what they they saw. When Colonel Halt was called to investigate, he fell in-step with the hype, misidentified stars, etc. for UFOs and rabbit scratching's for landing pod marks. He thought there was an over-abundance of radiation at a particular site when there was not, and additionally misidentified slash marks Thurkettle had said foresters put on trees slated to be thinned. Halt took them for burn marks made by an imaginary ET object he only thought he saw in the forest. Well, I understood Ian's View . . . BUT WHERE DO I BEGIN? Now that I knew where Ian was coming from, I had to pick a place to begin. I finally decided to start my examination with direct, deep focus on the exact statements from the airmen who claimed they saw something highly unusual in the forest, on what Ian considered to be the “first night.” It seemed to me that their statements were very important. If the airmen were wrong about what they claimed, Halt should never have been called out to the forest in the first place and this whole case shouldn't have had any reason to exist. Therefore, I decided their testimonies and that first night should be the first things I look at. Since neither Ridpath, Thurkettle, nor I were there with the witnesses to be able to say for sure what those witnesses really saw, I felt it definitely made sense to look very closely at the sum total of the witness statements from that night to get the clearest possible picture of what they say happened. To do this, one obviously needed to be thoroughly familiar with both Ridpath and Thurkettle's comments and solutions to what the witnesses said happened, so I began working at absorbing a few of them. Please forgive me. This next part is a little tedious, but extremely important to this analysis. It shows us some things I learned about Ian's website before I even began examining those witness testimonies in depth. Please bear with me. I promise it gets more exciting when we reach the actual testimonies, but I'm pretty sure what I have to say here might possibly surprise some of you. Did I have any immediate areas of agreement with Ian? 1) His investigation of, and findings regarding Halt's radiation readings. Considering the science support he had concerning same from British physicist Professor Frank Close, I felt that what he said was most probably correct. 3) I assumed the 3 AM meteor-type object was present the first night as Ian had a report from Dr. John Mason, British Astronomical Association confirming same. However I did want to look closer at that. Did I see any immediate areas of obvious disagreement? On my first read-through, I noticed that Ian informed us of a problem he had concerning Halt's 2010 Affidavit. This is what he said.
. . . click here . . .
"In 2010 June, Charles Halt wrote and signed a two-page affidavit in which he committed to paper his current memory of the events of the night of 1980 December 27/28 in which he was involved . . . . . . Unfortunately, this product of his 30-year-old memory differs so substantively from what he said and wrote at the time that it would be destroyed in a court of law."
. . . end quote . . .
. . . begin quote . . .
"If the purpose of this affidavit was to add credibility to the events of the Rendlesham Forest Incident, its effect is almost certain to be the opposite. It should now be clear that Col Halt’s pronouncements on the case can no longer be taken seriously, although they continue to provide entertainment value for those who wish to believe in the incredible." As I previously said, finding myself in agreement with Ian, I decided it definitely made excellent sense to restrict my analysis of Halt's statements to Halt's first memo and tape. But, isn't what's good for the goose, good for the gander? 1) "This was the first aspect of the case that I addressed once the story appeared in the News of the World in 1983 October, and I was quickly convinced by the suggestion of local forester Vince Thurkettle that it was the Orford Ness lighthouse. Within days of the newspaper report appearing, I visited Rendlesham Forest at night with a BBC TV camera crew to interview Vince and film the lighthouse flashing as seen from the forest." 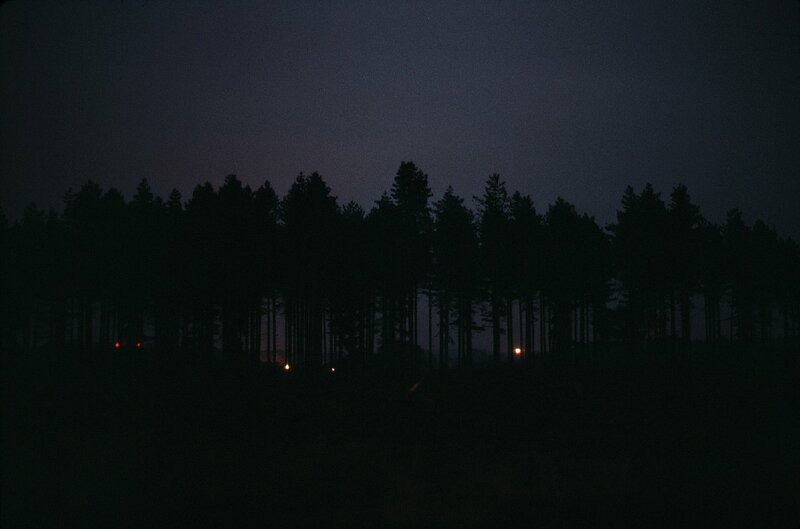 2) "Of all the questions that need to be answered about the Rendlesham Forest UFO case, the most significant has always seemed to me to be the following: what was the flashing light seen in the forest by the airmen on both nights?" 3) "However, it was not until many years later that I was able to pin down exactly where Col. Halt had been standing when he saw his flashing UFO on the second night of the sighting (i.e. the early hours of December 28). The clue came from an online interview Halt gave to Salley Rayl on the Microsoft Network in 1997 May, by when he had retired from the air force and felt freer to speak. 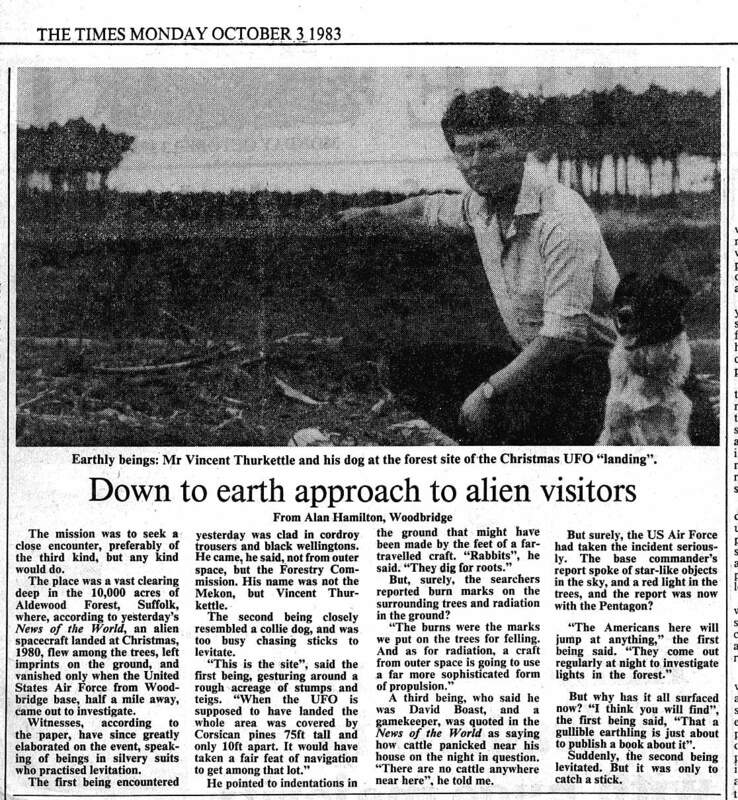 In this interview, the existence of which was brought to my attention by James Easton, Halt noted that the UFO had appeared closely in line with a farmhouse 'directly in front of us'." Then, as I read further, I noticed another problem. It was something in Ian's second paragraph above, the ignoring of which could negatively impact a fair, impartial investigation of this case in a major way. It turned out I couldn't completely agree with Ian that the most significant question should be "what was the flashing light seen in the forest by the airmen on both nights." You see, it's a loaded question which can cause one to analyze this whole thing with blinders on. The way it is worded, Ian's most significant question concerns a singular light that was flashing. This tends to lead one to think the most important thing in this case was that singular, flashing light. However, if we are to dutifully keep our minds fully open during our analysis, we have to fairly consider the possibility the lighthouse may not have been the only light-source. In that event, Ian's question would need a slight addendum. To include this possibility we have to ask; "Was any evidence found within the sum total of witness testimonies that indicated they might have seen something else in the forest in addition to that flashing lighthouse light at the time of the incidents?" Could there possibly have been anything seen in that forest that didn't really fit the description of the lighthouse . . . and if so, what do we think it was? I should point out, I was also perfectly willing to say that if the sum total of testimonies failed to indicate there was anything else there, that would have been fine with me. That would have been the end of the story and I wouldn't have had to write the rest of this piece. It certainly would have saved me a humongous amount of work. Unfortunately, that was not how this thing unfolded. There were two other items having to do with the lighthouse and forest area which then drew my attention. Since it was necessary to have a feel for the forest area and lighthouse when viewing the witness testimonies, I viewed the video-taped interview of Vince Thurkettle which Ian had provided. This portion, part of a longer video (made in 1983) showed us Thurkettle, the forest and the lighthouse. Then I read Ian's Times article concerning Thurkettle. Something said in it regarding the trees had me thinking. It was a quote from Thurkettle himself. A crazy thought: If we imagine for an instant that a true UFO from out there might have somehow actually been here, perhaps just a little smaller (or not) than the size both the witnesses and Thurkettle mentioned, how impossible would it be for that UFO to silently imitate a bat's movement using advanced, sophisticated computers, radar/sonar system or the like? If it was surveillance equipment of some type, it may have been operating without an occupant. We might also postulate a silent propulsion system since the U.S. military has been working on this as part of its stealth program, and we've seen ads on television here in the U.S. extolling sound cancellation in stereo earphones (Bose? ), etc. But, back to solid reality. . . how impossible is all this? Coincidentally, I just happened to come across an article appearing in Newsday March 1, 2011 which demonstrates that the technology for this sort of thing isn't nearly as impossible as one would first think. It appears we humans, ourselves, are on the forefront of something very similar. We are developing parts of our technology by observing and copying animals and insects. By using this next URL to click to that article, one will note it talks about a newly invented device. The device is the first of its kind and, originally contracted to be developed only five years ago. As you read it, try to picture something just a little bigger than that mentioned in the article. (and imagine someone having another 500 years or a great deal more to develop it.) But also keep firmly in mind, the Rendlesham case happened in December 1980 (i.e. approximately 30 years ago), and that what you are about to read didn't exist here back then because, if this article is accurate, the advanced technology and miniaturized electronics, etc., hadn't quite matured enough yet. After reading the article I thought to myself "If the military had that spy device in 1980, why would they ask these people to develop it only five years ago?" Obviously they didn't have it in 1980. Then, I also happened to remember a film I had recently seen which showed a company seriously working on automobile avoidance systems for cars. If a vehicle stops in front of it, the car automatically knows this and will stop or go around said vehicle. It also mentioned that similar device presently being tested on airplanes which can take off and land without a pilot, and which also contains a vehicle avoidance system for in-flight safety. After thinking about my museum experience, the article, and these present day marvels being developed, I realized that the concept of a mechanical device moving through the trees at Rendlesham definitely has a degree of plausibility today which it didn't have back in 1980. To be fair, Vince couldn't have known this back then. However, it certainly doesn't take much imagination to extend this into the future or to a futuristic society which might develop in the same fashion. Vince's comment was intended to tell us it would have been extremely difficult to navigate an object amongst those trees without bumping into the trees. However, we can all see that his comment needs to be taken with a grain of salt when viewed from the year 2011 and beyond. Still wanting to learn a little more about Rendlesham Forest, I continued my reading and noticed the following at the URL below (13th paragraph down.) This next quote from Ian appears just above a picture he provided of the forest edge. I was looking at that picture and that's when it hit me that Ian had just informed us the environment shown here wasn't really totally accurate to the night the airmen had their experience. From what he had just said, I realized the forest edge was actually a bit more dense that night as compared to the number of tree trunks I was presently looking at. 1) If the forest edge was more dense, how much light from the lighthouse, etc. could actually make it through the whole forest from one end to the other; i.e. all the way back to the east gate? 2) How far into the forest from the lighthouse would the light reach? and, just out of curiosity 3) How big would the lighthouse look from further back, at East gate? COULD THE LIGHT FROM THE LIGHTHOUSE HAVE REACHED ALL THE WAY TO EASTGATE? Just below this paragraph and in the next two are three of Ian's pictures of the forest. Depending upon how wide your browser is set, you will either see a large picture or a smaller one which can be clicked on to expand. However, clicking between the smaller-sized and larger picture brought an additional three questions to mind: 4) "What was the photographer's placement to the trees and lighthouse" (other than the GPS numbers Ian gave us - I've got to be able to translate them to a specific spot on a map) 5) "what lens was he using when he took the shot?" and 6) "Is what we are seeing in the picture the perspective we'd actually be seeing it in just using our eyes, or is the lens accomplishing the closeness?" Ian also provided us with two other pictures which were taken looking at the farmhouse with the lighthouse in the background. Here's the second one (farmandlighthouse). You can easily find the lighthouse in it because Ian circled it. Notice how far away it is. Now, having seen that one, you should also be able to find the lighthouse in this third one (fieldwide). It was taken from a slightly greater distance, not quite a full-field back from where the previous shot was taken. Of course, we really don't know the exact lens zooming on either of these shots. One thing that immediately caught my eye was that, as one would expect, as the photographer went back with the camera, the lighthouse in the background beyond the farmhouse definitely got visually smaller, being more distant . One can realize how really important knowing the lens and distance actually is. Was there more forest behind us and, how much? Then, another thought came to mind . . . "as we were looking at that farmhouse (in the pictures taken from the field), how much more forest was behind us . . generally back toward the east gate at the base?" I couldn't easily tell from the pictures when I had first looked at them. If there was a lot more, East Gate road is further away than one might think if one was only looking at those pictures. I wondered how small the lighthouse might actually appear from back at East Gate road, and how many trees would be in the way. So I set out to determine this. I looked at the above picture from Ian's site. The general direction to Bentwaters is to the left (the lighthouse would be generally to the right). At the minimum, we can see some trees to the left. When I used a URL Ian had given us to go to a Wikipedia map, I could see a better perspective of what the whole area looks like today (but not necessarily back then), and the distances involved. You can see it for yourself. When you get there using that URL below, you can use the map control on the left to zoom out a little. Just pull the bar to between the 7th - 9th line from the plus sign. If necessary, you can also use your left mouse button to click on the map, hold the button down, and move the mouse to the left, in order to scroll to the right. Play with these a little until you encompass the whole area from Bentwaters AFB to Orford Ness. Now you can notice there is quite a bit more solid forest to the left leading toward Bentwaters and Woodbridge, some of which not shown in the picture above. (At least 2000 feet altogether, perhaps more. That's a lot of tree trunks.) As a matter of fact, when I measured the entire distance between the east gate and where I thought the Orford Ness lighthouse was on the Wikipedia map, it looked to me to be at least 4 miles. If the trees were indeed more densely packed there, and the lighthouse appeared as low in the forest as shown in Ian's picture and as Thurkettle suggested in his video (remember, he also said the trees were 75 feet tall and ten feet apart), wouldn't one be less likely to easily see through those trees to the lighthouse, especially looking from the gate or not too far from East Gate road? It was about 4 1/2 miles to our camera from the lighthouse (looking at the farmhouse and lighthouse past it) with a minimum of 2000 feet of fairly tightly-spaced trees behind us. So, we all agree . . .
You see, from what we saw on the Wikipedia map above, and with both Ian's pictures and what both Ridpath and Thurkettle have said about the forest, we have learned he light from that source (the lighthouse) should have been entirely blocked by the general topography and that forest, especially at that distance. So one has to ask, what the heck was that light that almost came up to the road and that the airmen originally followed into the forest when this incident first began? You have to admit, this is a fair, important question. At this point we should all realize there was definitely more than one light in that forest, and one of them was particularly mobile. Evidently Ian and Vince had missed it, only being focused on the blinking lighthouse. It seemed the more I examined our previous discussion and various other issues along the way, I came to realize there were a number of little details, stated by Ridpath and Thurkettle, that didn't prove themselves to be either completely true or definitive under close scrutiny. Back to Thurkettle's video: What else does Ian say it is supposed to show us? Thinking about Thurkettle's video taken from inside the forest again, Ian's words in his second paragraph next to the picture caught my attention. Concerning the word "beam": When I think of a beam, I think of a ray of light similar to that from a flashlight (or larger light), moving slowly enough to see it move up a road or through the trees. The illumination I was seeing on Thurkettle was coming from the camera-lights. That’s why we could see his face and body so clearly, but I couldn't see any "beam" of light moving either through or over those bright TV lights. (At the previous URL, one can scroll down and view the text alongside and under the picture of Vince to see to what I am referencing.) Here's the video again. Perhaps you can find it. I had been wondering if a beam from the lighthouse could have somehow been responsible for the white light reported traveling through the forest at various times during the incident. However, I wasn't finding the video proof of this. I realized that in trying to apply anything from the video as a solution for the moving white light, I also had to consider the speed of rotation of the lighthouse light, its repetitiveness every five seconds or so, thickness of the forest, and the fact we all agreed the light could never make it all the way to East Gate road, etc. Whatever that light was that the airmen followed into the forest, I was pretty sure it wasn't the lighthouse. It is also important to keep firmly in mind, the general use of the word "forest," actually implies quite a large area, not just what we've seen in this picture from Ian. The forest-like area past the farmhouse . . . is that considered part of "the forest?" That area extends quite a distance . . . almost to the lighthouse. We can see that, to make any definitive statements regarding witness sighting events using photographic evidence, we must know exactly where the witnesses were standing during their sighting events, in which exact part of the forest the photographer was standing when taking pictures, what lens he was using at the time and, of equal importance, how any one of those pictures directly relate, or not, to the specific place(s) those witnesses were standing during each sighting event. As I read the descriptions I was still asking myself [like everyone else], "Was it all simple misidentification and hype?" If it was, I certainly had no intention of continuing to support the case because it is rather obvious, it would make no sense to support something that is unsupportable. It would obviously weaken the other extremely solid material displayed on my website, which I had spent years researching. (CohenUFO.org). But, that having been said, I was now not so sure, and very determined to find out if Ian was correct or not. I said to myself . . "You know, I wasn't expecting this. It's really getting quite interesting." descriptions and how I approached my analysis of them. I began with the testimonies from three airmen whom Ian considered to be the first night's witnesses. I typed out their statements to make them both larger and clearer for easier reading. (jc: My eyes aren't what they used to be.) Then I took each apart, spacing the events from each other, and eventually broke each into even smaller segments so I could more easily tell, to the best of my ability, each exact action that was occurring at any given moment. This produced a general sequence of events. One of the more important things I came to discover was that two of the airmen I just mentioned had drawn pictures of what they had seen. I decided that by comparing the airmen' statements and drawings, it might be possible to get some sense of whether those airmen were simply describing a meteor, the lighthouse light, the house, a prank by policemen, or anything else. I could see how Ian and others had arrived at their conclusion that nothing out of the ordinary had happened. [However, as you have hopefully already gathered, that was not the whole story, so please don't stop reading here.] It certainly seemed possible the airmen might have been fooled by simple farmhouse lights and the beacon. Ian also said it could have been a hoax by the military police but he didn't have enough evidence to prove it. So, at this point I was still thinking, "Maybe Ridpath is right." But then I thought . . "after the airmen got to the point where they had total realization they were looking at the beacon, why didn't they all just conclude the whole thing was a simple misidentification?" I started wondering if there might be anything in any of the other airmen's statements that might clarify this, so I moved on to another testimony; John Burrough's. As I began to read it, I immediately noticed how much more detailed it was than Cabansag's . . . . and I also noticed Burroughs had drawn a picture of what he claimed he had seen. I'll post that here first. I've also included this next link to Ian's version of Burroughs' drawing first -without any typing, if you'd like to view it that way. You can also click on it to enlarge it. or - Click here for my version below with my typing added. jc thoughts re above picture: Whoops! This was not a small, simple circular, blinking light as per Vince Thurkettle's video, and it didn't look to me like the big picture of the lighthouse at Ian's site or a meteor, but I was still going to keep my mind open to that possibility. Cabansag had said they identified the lighthouse. If the yellow light they came upon was just the lighthouse light, that should have explained it to Burroughs. I was also wondering if the yellow light was somehow sending out a white light? Burroughs said the red/orange ball moved "back and forth and up and down." Possible optical illusion on the back and forth but . . . the light on a lighthouse doesn't normally go up and down, and an optical illusion shouldn't either. Come to think of it, I don't remember there being a big, red and orange ball on top of the lighthouse, or blue lights, in Ian's pictures either. . . . I took another look. . . . . Nope, not looking like this. Burroughs said blue lights were blinking on and off inside the beam, but they came out when the object was stationary? Does a lighthouse [or more specifically, Orford Ness] do this? From what Thurkettle said, what Burroughs drew is supposed to be either the lighthouse, a patrol car, or the house. It obviously isn't a meteor and I didn't think it was the house. Also, from Ian's farmhouse picture, if the farmhouse was in front of them, the size is off. I don't see the lighthouse being the general size and detail in which Burroughs drew his object , and I would think you'd really have to be fairly close to the lighthouse to see it that big. (i.e. See Ian's picture for a more accurate rendition. Mine is larger) If you were that close, would one not recognize it as a lighthouse with repetitive light, etc.? For that reason, I thought that Thurkettle might have gone well-past the farmhouse or used a zoom lens when he made his video. If you haven't already done so, check Ian's picture for the size comparison, then check Thurkettle's video once more and see if you find the blue lights under a big red and orange ball which is going sideways and up and down on top of the lighthouse. At this point, I would hope at least some people should understand why I wasn't yet totally convinced what Burroughs drew was the lighthouse, farmhouse, meteor or patrol car . . . but I also didn't understand why Cabansag didn't mention that red/orange ball of light, etc. Kind of strange . . . we'll have to come back to this. One thing was for sure though . . . I was really glad I was taking this approach. I hadn't realized people had made drawings, etc. On the night of 25-26 Dec at around 0300 while on patrol down at east gate myself & my partner saw lights comming from the woods due east of the gate. The red one above the blue one and they were flashing on & off. Because I've never saw anything like that comming from the woods before, we decided to drive down & see what it was. We went down east gate Road and took a right at the stop sign and drove down about 10 to 20 yards to where there is a road that goes into the forest. I could still see the red and blue lights. We decided we better go call it in so we went back up towards east gate. I was watching the lights and the white light started comming down the road that lead [jc led] into the forest. We got to the gate & called it in. The whole time I could see the lights and the white light was almost at the edge of the road & the blue and red lights were still out in the woods. We asked permission to go and see what it was and they told us we could. We took the truck down the road that lead [jc: led] into the forest. as we went down the east gate road & the road that lead [jc: led] into the forest the lights were moving back and they appeared to stop in a large bunch of trees. We stopped the truck where the road stopped and went on foot. We crossed a small open field that lead [jc: led] into the trees where the lights were coming from & as we were comming into the trees there were strange noises, like a woman was screaming. also the woods lit up and you could hear the farm animals making alot of noises & there was alot of movement in the woods. after a minute or 2 we got up and moved into the trees & the lights moved out into the open field. We climbed over the fense [jc: fence] and started heading toward the red and blue lights & they just disappeared. once we reached the farmer's house we could see a beacon going around so we went towards it. We followed it for about 2 miles before we could see that it was coming from a light house. We had just crossed a creek and were told to come back when we saw a blue light to are [jc: our] left in the trees. It was only there for a min and it just streaked away. After that we didn't see anything so we returned to the truck. So, two of my questions . . . .
1) “Why didn't the airmen just assume they had been watching the lighthouse all the time? plus the white light below. A white light would come out below the [jc: red/orange?] beam in the trees. jc: He didn't say the red/orange beam or the white beam was blinking or pulsing. jc 4/3/2011: So, unless someone knows something which I haven't learned so far, what Burroughs described here does not sound like the lighthouse. I definitely had the feeling there was something else in the woods, not just fixed lights on or from a lighthouse. Even if the red and blue lights turned out to be nothing, the white light was definitely moving around through the woods. Evidently, it moved at the road while they were watching the lights from the gate. (where the lighthouse shouldn't have been able to be seen) When the security unit got there, they could see it too. It also moved after they had hit the ground. Something was there and they felt it was causing the animals to make an inordinate amount of noise. It even moved behind them. Also, Burroughs did see the blue light again for a minute as they were coming out of the forest. He said it _streaked_ away. So interestingly, that _blue light_ was seen moving as well. It wasn't just stationary. All this is probably why, when the airmen followed the blinking light which turned out to be the lighthouse, they couldn't totally eliminate what they had previously seen. jc: But right now I was thinking, "Is it possible Burroughs' drawing was hoaxed?" I'll have to look into this. I guess if it was hoaxed, I might understand why Cabansag didn't back him up, but I was also wondering whether they might have been told by investigators not to say anything. I'd need more evidence to prove either of those scenarios. Was it possible the other two airmen decided they weren't going to remain silent? I moved on to Penniston's account. As I looked at Penniston's testimony I discovered he, too, had drawn something _he_ claimed he had seen. It wasn't just one picture . . . there were three. I looked at all three first, then I compared what he drew with Ian's picture of the forest and Thurkettle's video once again. Maybe the yellow glow was the lighthouse (yellow light) or farmhouse. Still not sure about the red and blue lights. He has them grouped tightly together to the right. “At the left were two [jc: small] red lights on tall aerials on Orford Ness itself. and Ian's picture showed the red on the left. but they appear upside down from one another. I'm going to show you that Page #2. On each view, the side-up part appears at the bottom half. The side-up part at the bottom of this first view doesn't show much. Page #2 <- After clicking on the Page #2 URL, scroll down a little again to bottom half. As I said, not much on the bottom half above. the next bottom view shows a definite object. near the typing. My typing is just a reiteration. Page #2 flipped <- Click here, then scroll down a little again to bottom-half of this page. blue light across and blue glow below. jc Initial thought: "This may support Burroughs." 2nd: "I don't think it looks remotely like the light-house, in Vince's video. Farmhouse? What's with the red light on top? I'll have to check his testimony." 3rd: "but it really doesn't look like the object in Burroughs' drawing either." 4th: "and, where did Penniston see this if they were all together?" 5th: "If this was a hoax and Penniston was in cahoots with Burroughs, why didn't he draw the exact same craft?" Why draw a different one?" 6th: ". . . and why didn't Cabansag back him up on this? I don't get it "
jc 4/16/2011: Hmmn, . . . they separated on the way back. Why did Penniston do that? Could what he had drawn possibly have been . . something he saw on his way back to the vehicle? Also, I was now wondering if each of them saw a different object. Two separate objects might explain why he didn't draw the exact same thing Burroughs drew and why Cabansag's testimony didn't include what Penniston drew. I wondered if there was any proof of this anywhere? Here is PENNISTON'S original typed statement. It is typed, legible and . . . interestingly . . . much shorter than Burroughs'. Penniston said he "received a dispatch from CSC to rendezvous with Burroughs and Steffens at east gate, Woodbridge. Directly to the east about 1 1/2 miles in a large wooded area, A large yellow glowing light was emitting above the trees. In the center of the lighted area directly in the center ground level, there was a red light blinking on and off in 5 to 10 second intervals." jc: Was the red light one of the blinking antennas in Ian's drawing? The blinking was occurring in 5 to 10 second intervals. A regular interval would most likely be normal for antennas. Perhaps if it wasn't exactly a regular interval that might indicate something. But why was the red light directly in the center of the large yellow glowing light, and why was there only one red blinking light? I remembered, the two red lights were off to the left in Ian's picture . . fairly close together from where the LightsAtNight picture was taken. If a tree was blocking it momentarily, wouldn't they have eventually seen the second one when they moved? "And a blue light that was being for the most part steady." "we proceeded off base past east gate, down an old logging road. They left their vehicle and proceeded on foot. Burroughs and I were approximately 15 to 20 meters apart and proceeded on a true east direction from the logging road. The area in front of us was lighting up a 30 meter area. When we got within a 50 meter distance, the object was producing red and blue light. The blue light was steady and projecting under the object. It was lighting up the area directly under extending a meter or two out." jc: Penniston says the object he saw was producing both red and a steady [not pulsing] blue light extended out under it a meter or two. If we are to think this was one of the antennas in Ian's picture, where was the steady blue light coming from? "On the way back we encountered a blue streaking light to left lasting only a few seconds." jc: That blue light was seen again on their way back out of the forest. And this was really interesting: Penniston doesn't mention separating from the group on the way back, and yet Cabansag remembers it . . . . and Cabansag's testimony seemed totally innocent. He was the least supportive of an ET connection. Why would he lie? jc: Was this from the lighthouse? Remember, from looking at Burroughs' testimony, we couldn't see any blue in Ian's picture. thinking about Cabansag, the suspicion the airmen might have been interrogated by someone and told not to say anything about what they saw was getting a little stronger." Having looked at these first three testimonies of the airmen who went into the forest, I now decided to look at some of the other people's testimonies to see if there was anything that might shed any more light on any of this. I also wanted to see if the other testimonies dovetailed with the previous three or if they were different. I started with the most senior officer who was on-duty back at CSC. His name was Fred Buran. 3) Penniston had previously informed Buran that the lights appeared to be no more than 100 yards from the road east of the runway. 4) When the three airmen went into the forest they appeared to get very close to the lights (Matches Burroughs' testimony at URL). 5) Buran monitored their progress. 6) Due to the colors the airmen reported, Buran suggested to them they may have been approaching a light-aircraft scene. 8) Penniston reported getting near the object, then _all of a sudden_ reported they had gone past it and were looking at a marker beacon that was in the same general [area] as the other lights [when they were originally approaching them]. 9) When Buran asked Penniston if they could have mistaken the marker beacon for the other lights, Penniston replied "I had seen the other lights. I would know the difference." SSgt Penniston was somewhat agitated at that point. 10) Buran asked Penniston to take notes. 11) After talking to Penniston the next morning, Buran was convinced that Penniston saw "something out of the realm of explanation for him at that time." 12) Buran testified that Penniston was "a totally reliable and mature individual" and also said "nor do I think he is subject to overreaction or misinterpretation of circumstances." jc comment:) It appears that Buran basically confirms what Penniston said in his testimony. After reading Buran's statement and the fact that Buran felt Penniston was a totally reliable person and didn't seem to be "subject to overreaction or misinterpretation of circumstances", I could then understand why Penniston might have taken a different route back than the other airmen. Since he was the officer in-charge in the forest, it was his responsibility. I would think he probably wanted to go back to double-check he hadn't somehow missed what he had originally seen. Penniston said what he originally saw wasn't the same as the blinking, lighthouse light. He was rather clear about this when speaking to Coffey and Buran. Now I was starting to wonder what else I was going to find. I had seen what Coffey relayed to Buran at CSC and vice-versa.Now, since JD Chandler was just outside the forest at the vehicle relaying messages from Penniston to CSC, I decided to check exactly what JD Chandler had said Penniston relayed to him, and which he in-turn relayed to Coffey/Buran. I wanted to compare it with what Chandler said to Coffey and if it was all being passed accurately from person to person. So I planned to read Chandler's statement next but before doing so, I extracted the following points from Buran's testimony. "On one occassion Penniston relayed that he was close enough to the object to determine that it was deffently [jc: definitely] a mechanical object. He stated that he was within approximately 50 meters." Penniston reported getting near the object, then _all of a sudden_ reported they had gone past it and were looking at a marker beacon that was in the same general [area] as the other lights. "He eventually arrived at a "beacon light", however, he stated that this was not the light or lights he had originally observed." Penniston was certain of it, and this seemed to support Burroughs, even though they drew different objects. [jc: So, it seems there was a light that was most-likely moving , and Penniston's testimony is actually supportive of Burroughs' testimony here. Ridpath seems to have overlooked this. I believe Penniston's statement gives definite indication that Ridpath's thinking may indeed be wrong concerning what he thought was Penniston's inaccurate distance estimation. To this point, almost everything appears in sync, at least between the testimonies of the witnesses and conversations with CSC, and again, those testimonies to this point still seem to be telling us there definitely was something in that forest that wasn't the lighthouse, farmhouse or meteor. Let's see what Chandler says. Chandler's testimony was rather short, however . . . He (JD Chandler) . . .
1. was called there by Penniston. 2. acted as a radio relay (just outside the forest) between Penniston in the forest and CSC. 3. verified Penniston saying he was within 50 meters of the object. 4. verified Penniston saying when he got to where they identified a beacon light, this was not the same light or lights they had originally observed. 5. After talking to the three airmen, he was sure they had observed something unusual. I did not see a statement by Sergeant Coffey with the other testimonies at Ian's website, but Coffey was working the radio at CSC. Since Buran and Chandler's statements were in-line, both with what Penniston said and with each other, it would seem Coffey had to have passed the information he heard on the radio correctly. Cabansag's testimony supports an ET presence the least, but it does present the fact Penniston separated from the group [second paragraph at URL] when they were going back to the car. It is possible that may have been when Penniston saw the object he drew in the sketch made regarding the first night. There were blue lights which were blinking on and off inside the beam. The blue lights would come out of the beam and a white light below. It is noted the blue light is not an observed part of the lighthouse, nor is the beam of red and orange. The object Burroughs' described didn't seem to resemble the lighthouse, farm house, or meteor. I also found it important to observe that what Burroughs drew does not appear in Vince Thurkettle's video or Ian Ridpath's pictures. "We got to the gate & called it in. The whole time I could see the lights and the white light was almost at the edge of the road & the blue and red lights were still out in the woods." "I was watching the lights and the white light started coming down the road that led into the forest". This researcher believes if it was a repetitive motion such as the lighthouse would make, it would have been noticed as such and most-likely commented upon. Considering the speed of rotation of the beacon, it would have only taken approximately fifteen seconds (three rotations) to determine this. However, more importantly: Prior to even starting my main analysis of these witness testimonies, I had already demonstrated all had agreed that it was impossible for the lights from the lighthouse area at Orford Ness to have reached all the way to East Gate road. That white light could not have been the lighthouse light . . and the blinking red lights from the antennas couldn't have reached there either. Additionally, since the sum of the Dec. 26 testimonies indicates what they had followed was there for a great deal more than four seconds, it also could not possibly be directly attributed to the meteor. Another Burroughs statement (further into his testimony): "as we went down the East Gate road & the road that lead [jc: led] into the forest the lights were moving back and they appeared to stop in a large bunch of trees." [jc: N.B. Lighthouse lights do not usually stop.] and yet another: "all three of us hit the ground and whatever it was started moving back towards the open field." This demonstrates it wasn't any movement by them that caused this. In his video, Thurkettle had previously said it was their movement that made them think the light was moving, however he is definitely not correct in this instance. It was clearly stated that, in this instance, the airmen were in one place while the light was moving. Additionally, that white light had moved while they were near the gate, when they shouldn't have been able to see the lighthouse light in the first place. On the way back [after having gone into the forest], they also saw something for at least a few moments; "a blue light to their left that 'streaked' away;" again a blue light that was not indigenous to the forest. The "Streaking away" was most-likely not caused by their walking. Moving is one thing, streaking is another. jc: Brief observation I had made regarding Burroughs - Burroughs' drawing and descriptions within his testimony, at least to me, do not seem to indicate a standard lighthouse. It would appear this is why, in one part of the sighting, when the airmen followed a blinking light which turned out to be the lighthouse, the realization of same didn't solve what they had previously seen. Whatever Penniston saw did not sound like the lighthouse light. "He eventually arrived at a "beacon light" however, he stated that this was not the light or lights he had originally observed." So we have learned that Penniston definitely recognized the "beacon light" and differentiated it from the lights they had originally followed into the forest. He was certain of it. Therefore, the summation of the things I discussed above should indicate to most reasonable people that it is not written in stone that Penniston made any mistake here. With the total accrued information gathered so far, we have a definite indication there most likely was something else in that forest besides the lighthouse; especially taking into account the testimonies of the airmen prior to and initially going into the forest plus other specific testimony and the drawing from Burroughs. As I think I previously asked . . . if the two were in on a hoax together, why would they choose to describe two different objects? I believe I may have found a possible answer to this in Halt's testimony two nights later. Furthermore, Buran and Chandler's statements were completely accurate to what Penniston said, and also appear to lend support to the other two airmen's versions of what happened as well. Since all the statements were basically consistent, Coffey had to have passed his information correctly. Besides what I've already said about Buran, it is also to be noted, he supported Penniston's character when he testified that Penniston was "a totally reliable and mature individual" and additionally said, "nor do I think he is subject to overreaction or misinterpretation of circumstances." In other words, Buran felt Penniston was a level-headed individual and had basically good judgment which didn't seem to be affected by what they experienced. He was simply looking for an answer to what he saw. If you remember, in his interview from "Breakfast Time", Thurkettle had said the airmen described the light they saw as a "pulsing white light." . . . "and if that wasn't the light they saw, then what they are saying is that, within their line of vision, there were two pulsing white lights illuminating the forest." In reviewing the testimonies, we discovered Thurkettle's statement wasn't completely true because not all the lights seen were described as pulsing, flashing, or only white. Thurkettle either never read them or ignored them. By simply looking at Burroughs drawing once again, and reading his testimony carefully, we discover Burroughs did not say the blue lights he saw were blinking on and off inside a pulsing beam. Although the only pulsing white light Burroughs and Penniston did describe seemed to be attributed directly to the beacon, it was recognized as a beacon. Thurkettle seems to have missed that and the rest of it as well. He didn't notice the initial white beam the airmen followed into the forest which was never described as pulsing. But perhaps, Ridpath or Thurkettle can point out to us (in Burroughs' drawing) where the white "beam" Burroughs said he saw coming from the object was described in that manner? Additionally, as mentioned several times, we all previously agreed (Ridpath included here as well) that the initial light the airmen followed into the forest could not have been from the lighthouse. Furthermore, in Penniston's communication to Chandler, the accuracy of his comments supported by Chandler, Coffey and Buran, clearly stated that the light he saw from the beacon wasn't the same light he originally came looking for. Therefore, there is much supporting testimony to indicate there was definitely more than one moving light they were following. In the total context of the testimonies, Thurkettle's pulsing white light comment, therefore, becomes greatly diminished in significance. What about that December 26th Meteor? Credit previously given to: Dr. John Mason, British Astronomical Association for providing the meteor report of 26 December 1980. "This thing came down, the red light over it, and sat there maybe two seconds . . there was just a ball of light in the air, maybe twenty feet . . thirty feet . . and it dispersed in a multitude of colors . . . and they all seemed to fall on top of this thing . . . and before our eyes, it is almost indescribable, but there was a craft . . an alien space-craft, whatever there." We note, on Ian's page URLed below, we were told Dr. Mason had informed us the meteor was only in view three to four seconds. Some observations and questions from CohenUFO: It seems we are being asked to believe that in that three or four seconds, the meteor coming down either exploded, or looked like it exploded, over the lighthouse in a multitude of colors, which thereby got the airmen to think the lighthouse, etc. was the object(s) we have already seen in the pictures at the URLs below. If this is what Ian is saying, we still need to see if his suggested solution could really cause or be responsible for what the airmen drew. The answer I get when I look at the above drawings is . . . no, I still don't see the connection. Perhaps some readers will see something different. In any event, this is why I found myself necessarily formulating the following questions. Whether or not you agree with me on the previous point, I believe you will find these questions to be pertinent. 1) Was the head of the "brilliant meteor" Dr. John Mason informed us of red/orange? 2) Have any other scientists described this particular meteor that came down that night as a red/orange meteor? 3) Do we have a picture of this particular meteor? 4) Who else saw it? 5) Were there any articles in any of the papers concerning this particular meteor? 6) Was it perhaps described as a red meteor in the article? 7) What direction was the meteor coming from? 9) Do we have any pictures of it exploding? 10) Can we see this picture and its verification? 11) Did anyone happened to see where it landed? 12) Were any pieces of it recovered? 13) Did anyone describe this particular meteor as having a flaming or glowing tail? Interestingly, the security guard in Ian's Breakfast Time video did not mention a flaming tail following behind it, nor does this seem to appear in any of the other testimonies. I found it odd that detail was left out of everyone's descriptions. I thought to myself, that is probably something at least one person somewhere (airmen, scientists, etc.) would have noticed and probably mentioned if they were all describing a meteor. This needs to be examined. CohenUFO: As I already indicated, Ian had made a really good point even though he didn't completely learn from and apply what he discovered in his investigation. It is important to stay focused on what Halt originally wrote down and recorded close in time to the incidents since, as Ian demonstrated, the facts in Halt's mind seem to have drifted with time. Since Halt's early 1981 memo and his tape recording were both prime pieces of evidence regarding the sightings, it seems rather important to examine these particular two items against one another. In my analysis of the Halt data, I was still searching for information that might support what the witnesses had said in regard to seeing object(s) in that forest the first night and I was curious to see if Halt's testimony would relate in any meaningful way to their testimonies, even though his sighting occurred two nights later. Was there anything that might connect everyone's first hand testimonies and which might indicate Halt may have seen something other than the simple stars Ian had proposed. Let's take a look. IS HALT'S TESTIMONY REGARDING Dec. 28th IN ANY WAY CONGRUENT WITH THE REPORTS FROM THE Dec. 26th WITNESSES? "As for the star-like objects in the final paragraph of Col. Halt's memo, they were probably just that - stars. Bright celestial objects are the main culprits in UFO sightings and have fooled many experienced observers, including pilots. The object seen by Col. Halt to the south was almost certainly Sirius, the brightest star in the sky." "Immediately thereafter: 3 star-like objects were noticed in the sky. "Objects moved rapidly in sharp angular movements and displayed red, green and blue lights." Although I've been an avid star-watcher ever since my own incident many years ago, I have never seen stars move quite in the manner Halt describes. I have seen them appear to vibrate slightly and/or flare at times, but never with "sharp, angular motion"; especially with the naked eye. In any case, if a movement of anyone's eyes were responsible for this, all the stars would most likely move together with this sharp angular motion; not just one star. Additionally, since clouds move smoothly across the sky and do not jut around in an angular fashion, we cannot say that clouds were the cause of this "sharp, angular motion" either. It seems to me . . . if the objects were truly moving the way Halt and others described them, and they additionally displayed some of the colors the airmen had seen and described two nights prior, this could be an indication they weren't seeing stars. I wondered if Halt said anything else that might lend further support to this. "More puzzling, perhaps, is this quotation from Halt’s tape:"
“Here he comes from the south. He’s coming toward us now. Now we’re observing what appears to be a beam coming down to the ground”. jc: Wanting to learn more about this and gather more information concerning Halt, I downloaded other excerpts from Halt's tape also found on Ian's website. I read them carefully, notating some of my thoughts. Then I compared Halt's 1981 memo against the dialogue from that tape and discovered that several parts of the tape actually support and further clarify what Halt said in his memo. However, Ian doesn't mention this. Instead, he explains his thinking regarding the beams Halt claims he witnessed coming down to the ground. "Perhaps the most sensational description on the whole tape is: 'Now we’re observing what appears to be a beam coming down to the ground.' This beam came from the starlike object in the south which, the memo tells us, remained visible for two or three hours. In Point 14 above, I identified the two objects to the north as the stars Vega and Deneb. This one is even easier to identify: it is Sirius, the brightest star in the sky. Very bright objects cause glare in the eye which gives the impression of spurious shapes and extensions. A famous example was the ‘flying cross’ reported by two police officers in Devon in 1967. In another case I looked into, a UFO in Spain reportedly descended to a height of 7 to 8 metres above a car and lowered landing gear. In both cases the object was Venus. Although Sirius is not as bright as Venus it can still exhibit similar effects." jc: I couldn't help but notice the last several lines concerning the Spain case. The people in that case had testified that a UFO "descended to a height of 7 to 8 meters above a car and lowered landing gear." Mind you, this is something someone claims they saw only 8 meters above the car. (approx. 9 yards) Ian then tells us what was seen was actually the planet Venus, and leaves us with the unspoken suggestion the whole thing was just the person(s) imagination. I do not know much about that case but I do have to ask the following: Anyone who has ever had a star "cause glare in your eye (without using binoculars or telescope) and give the impression of spurious shapes and extensions" to the point you would think it was a space ship, please raise your hand. Anyone who has seen Venus look like it has "descended to 7 to 8 meters above your car and then lowered landing gear," also please raise your hand. Finally, anyone that thinks this specific methodology used to explain a case containing this type detail at the cost of intelligent, rational reasoning is truly scientific and that it will help us to learn anything about the case, please . . . . . Certainly, if one believes the witness(es) were lying or hallucinating, then by all means, one should say so and explain or justify why he believes so. However, it seems to me, offering a ludicrous explanation of this type can have no other result than to make its proposer look more hallucinatory than the witnesses whose testimony he is trying to negate. From the transcript of the tape that appears below, we can clearly see Halt specifically said two times and implied a third that he saw a beam coming down to the ground. The word "to" in this context implies actually touching the ground; "toward" would imply aiming directionally at the ground but not necessarily touching it. I can categorically state, in forty plus years of star watching, I have never seen any star radiating a beam of light all the way to the ground in a beam, or even close to it. Therefore, I believe what Halt said may have great significance. Does it really matter in this case whether stars sometimes twinkle with colors or if our eyes sometimes react with auto-kinetic movement? Halt did not say the stars were simply twinkling, flaring, or vibrating in the sky. He said the objects moved with "sharp angular movements" and that in some instances they were moving away, coming closer, and sending down a beam to the ground. Looking at the material located at this immediately previous URL or other excerpts from Halt's taped comments below, one can note others present had even confirmed some of this on the tape. Did they all have auto-kinetic problems? Now, when we examine Ian's methodology used to negate Halt's testimony, and then consider his methodology regarding the Spain case, I would hope one would not fault me for suspecting he could be applying a similar approach here. When I came to Ian's following words . . .
Ian: "I reached my conclusion before Col. Halt’s tape recording of events was released." I cannot be the only one who thinks the juxtaposing of the tape and the memo is an important facet of this investigation.
. . . Begin Tape Excerpt (made December 28th, 1980) . . .
HALT: There is no doubt about it – there’s some type of strange flashing red light ahead. HALT: I saw a yellow tinge in it, too. Weird! It appears to be maybe moving a little bit this way? It’s brighter than it has been. HALT: It’s coming this way. It is definitely coming this way. HALT: There is no doubt about it. This is weird! VOICE (NEVELS? ): Two lights – one light just behind [?] and one light to the left. HALT: Keep your flashlights off. There’s something very, very strange. . . . snip . . . . . . snip . . .
HALT: OK. Pieces are falling off it again. ENGLUND: Sir, it just moved to the right. HALT: Strange! One again left[?] Let’s approach to the edge of the woods up there. Do you wanna do it without lights? Let’s do it carefully. Come on. HALT: Yeah, like a pupil of an eye looking at you, winking. And the flash is so bright to the Starscope that it almost burns your eye. [IAN’S NOTE: The starscope amplified light by about a thousand times and had a magnification of 4 times, so naturally the light appeared much brighter and larger than to the naked eye.] . . . snip . . .
HALT: We’ve passed the farmer’s house and are crossing the next field and now we have multiple sightings of up to five lights with a similar shape and all but they seem to be steady now rather than a pulsating or glow with a red flash. VOICE: Here we go... . . . snip . . .
HALT: 3:05. We see strange strobe-like flashes to the... rather sporadic, but there’s definitely something there. Some kind of phenomenon. HALT: 3:05. At about ten degrees, horizon, directly north, we’ve got two strange objects, er, half moon shape, dancing about, with coloured lights on ‘em. At, er, guess to be about five to ten miles out, maybe less. The half moons have now turned into full circles as though there was an eclipse or something there for a minute or two. HALT: 03:15. Now we’ve got an object about 10 degrees directly south, 10 degrees off the horizon. BALL (? ): This one on the right’s heading away, too. HALT: They’re both heading north. Hey, here he comes from the south, he’s coming toward us now. HALT: 03:30 and the objects are still in the sky, although the one to the south looks like it’s losing a little bit of altitude. We’re turning around and heading back toward the base. HALT: Definitely moving . . .
ENGLUND: . . . off to the right. NEVELS: . . . to the left . . .
HALT: And the ones to the north are moving. One’s moving away from us. BALL(? ): This one on the right’s heading away, too. *HALT: Now we’re observing what appears to be a beam coming down to the ground. [jc - In this taped evidence, Halt gives us a 3:15 marker and a 3:30 marker. If this is a a star he observed, it took a full 15 minutes to have noticibly lost some altitude. Ridpath has told us the moving objects Halt and his troops saw were stars. Yet, we can see two types of movement here; the rather energetic, rapid movement of the objects described by Halt and his men vs. this star he noticed in the south. We seem to have some stars moving rapidly and others at a snail's pace. HALT: 04:00 hours. One object still hovering over Woodbridge base at about five to ten degrees off the horizon, still moving erratic and similar lights and beaming down as earlier. jc 4/19/2011: From what I can tell, although the lighthouse light could have possibly been misidentified within one portion of this sighting, and there could have been a possible misidentification of stars at one point, many of these taped items appear to confirm definite movement in the sky not having to do with the star background, and do seem to further amplify section three (3) of Halt's written memo. Furthermore, since the airmen from the first night also both testified to and drew blue lights (not native to the forest or the area in general), and Halt witnessed the colors blue, red, and green on the three objects he described flying indicates it is at least possible that what Halt saw during his encounter could have been related to what Burroughs and Penniston drew. Although not definitively proven, this circumstantial evidence should, at the very least, open a reasonable person's mind a bit to this scenario. Some of the lights seen pulsed with or contained blue, a color not indigenous to the forest. This color did not emanate from the lighthouse or the antennas previously described by Ridpath. The three flying lights Halt had seen were radiating some of the same colors drawn by Burroughs and Penniston. Halt saw red and yellow in an object during the taped sighting. Penniston saw a yellow glow with a red light on top. More importantly, if we take Halt's testimony regarding the three "star-like" object(s) at its face value (rather than just assuming he saw stars), we suddenly discover that his testimony has the potential of explaining how Burroughs and Penniston could have submitted drawings of two different objects concerning their incident two nights earlier on Dec. 26th. With that number of observed objects (Halt 12/28) , it is not impossible two could have landed that first night (12/26) while one could have remained hovering. However, this rather important connection vanishes when Ridpath and Thurkettle, without having carefully juxtaposed all the testimonies with one another, and with blinders firmly in place, classify Halt as a simple misidentifier of standard astronomical phenomena. If one clicked on the last URL above he/she could see this scenario seems to have been further supported by the later testimony of Rick Bobo to Georgina Bruni. It seems possible, if not likely, Bobo's sighting happened the night of Halt's sighting (Dec. 28). If this is so, and three objects were flying there, would it be so impossible for one of them to have been hovering while two others landed two nights earlier during the Dec. 26th sighting? With all the other evidence we have throughout this case, it certainly is something to consider. We do have suggestive proof this may have occurred. Even if Ian and Vince are right about the fact that Halt misidentified some of the things he was seeing, which could have happened, there is enough additional data to indicate that Halt may well have seen some other legitimate, not misidentified objects as testified. The possible connection between what Halt saw and what the airmen followed into the forest has been more than adequately demonstrated within this analysis. It is for all the reasons above, after reading the witness testimonies (including Rick Bobo) then reviewing Halt's 1981 memo and Halt's tape from Ridpath's website, I find it impossible to reach a definitive conclusion that the objects Halt saw in the sky on December 28th were simple stars. Whether one likes it or not, the determination of same is just not that simple. I do not believe the elliptical vs. circular image issue is nearly as important as other information found in Halt's tape and first memorandum. Yes, Ian could be right regarding the elliptical vs. circular binocular item (Unless this observation was also made with the naked eye. Do we know it was only seen through binoculars for a fact?) and yes, stars certainly may have been visually present, but as I've shown, Halt's words still seem to indicate that certain things he saw appeared to be moving independently of the sky above. Again, after thoroughly examining the testimonies from the witnesses regarding the first night's events (which had included drawings from two of them, taken from Ian's site) I believe it reasonable to think Halt's testimony regarding the "Starlike" objects is most likely accurate and exactly what he says it was. But I certainly find this next issue of even greater interest to me. ONE SLIGHT PROBLEM CONCERNING THE THEORY THAT CLAIMED CRAFT IMPRINTS COULD SIMPLY BE ATTRIBUTED TO "RABBIT SCRATCHINGS"
indentations made by an animal and those made by a landed UFO? " jc answer: It's a good question. It would seem logical there would be smooth compression of the earth where the weight of the alleged craft had pushed into the ground after landing. At the 2007 Washington Press Club testimonies, Halt (correction: Penniston) displayed a plaster of paris cast he said was made at the time of the sightings. Ian even displayed that photo for us. Rabbits have nails on their feet with which they dig holes for various reasons. The holes they create do not come out perfectly smooth and/or symmetrically curved at the bottom. Now if a rabbit or another animal had dug in the holes from which Halt (Penniston) made the casts, I would think there should be at least some obvious scratch marks on the bottom of the cast. I simply note here for the record, Ian's picture of Halt's (Penniston's) generally symmetrical plaster cast, that appears at the URL at the end of my previous paragraph, does not seem to have any scratches on it. Therefore, I would be remiss in not asking "Would the cast be as smooth and symmetrical on bottom as it appears in Ian's picture if a rabbit or some other animal made them?"
. . . and this last issue leads us to this next one. Thurkettle says the site he saw had what he classified as rabbit scratching's. With what I have researched to this point, I find myself necessarily having to ask the following, as crazy as this may at first sound; Could it be somehow possible Thurkettle was at the wrong site when he took his pictures? jc 4/30/2011: From what Halt said in that memo, how do Ridpath and Thurkettle really know for certain Thurkettle was actually taken to the correct site? We can't have it both ways. If the airmen _didn't_ mark the site when they left, and Halt isn't sure how they found it again, how does Thurkettle positively know he was really at the exact spot of Halt's sighting when he was brought to it six weeks later and that the "rabbit scratching's" (and tree slashings) he observed were indeed from that original site? We do have the plaster cast from Halt (correction: Penniston). If Thurkettle may not have seen the original landing site, did Ridpath perhaps see it? "We filmed the interview in the area where Vince had been shown the supposed 'landing marks' on the forest floor some weeks after the event. By the time of my visit in 1983, though, the trees in the area had been cleared and any sign of the landing site was long gone. A daytime view of the same area as it appeared in 1983 can be seen here." Particularly significant from the air defence point of view were the events of the second night, when Col Halt reported three starlike objects hovering for several hours over Rendlesham Forest, apparently sending down beams of light. While this was going on, Halt asked his command post to contact Eastern Radar at RAF Watton, which was responsible for air defence of that region. The senior operations officer on duty at RAF Watton that night was Squadron Leader Derek Coumbe. In 2003 he recalled for BBC Radio 4 that several calls had come through from Bentwaters asking them if they were seeing anything unusual in the Bentwaters and Woodbridge area. “We scrutinized the radar time and time again completely, and kept a watch on it through the whole period when these phone calls were going on and nothing was seen. Nothing at all,” Coumbe told the BBC. (Thanks to Dave Clarke for the transcript. See also under the heading “Radar and Radiation” on this page from Clarke’s website.)" A note on the log in indicate that ATC at West Drayton were contacted and that there was no known knowledge of aircraft in that area to coincide with the time of the sighting. However, mention is [also] made on the log of reports received of aerial phenomena over Southern England during that night. jc) 1/22/2011: If the MoD actually did dismiss the case as Ridpath states, this could indicate a possible lack of knowledge on their part concerning a number of well-investigated cases where UFOs are seen visually but do not show up on radar. MoD may not have had enough of these cases 30 years ago, but this would have to be researched if it hasn't been already. It is important to realize, the lack of radar confirmation Ian Ridpath mentions above is not proof positive that Halt and his team misidentified what they claim they saw. Because there was no radar contact does not prove there was nothing there. As previously noted, we have existing well-investigated cases where this has been demonstrated to have occurred. Example: O'Hare Airport USA November 7, 2006 - An object hovered just out of sight of the O’Hare control tower operators, over a main terminal, and left punching a hole in the cloud cover upon exiting. Although the O’Hare object was seen by many professional airport personnel it wasn’t picked up on radar, even though it was over one of the main airport radar facilities. A summary and direct links to the actual report, as well as a news video concerning the incident, are provided below.
. . . furthermore . . .
"Also of great significance are government documents released since 2001, initially obtained by fellow researcher Dr. David Clarke, which confirm that the UK's Ministry of Defence (MoD) never considered the case worthy of a serious investigation, and we also know why. In short, there was no cover-up because there was nothing to be covered up." I would actually surprised if this investigation were _not_ triggered by this event. Just because Ridpath couldn't find data that proved the MOD and Americans investigated this case thoroughly doesn't mean they didn't investigate it . . . especially the Americans. Are we to think they just ignored all this? Would we know if an investigation occurred? - Americans have been repeatedly shown to be secretive throughout history regarding UFOs. Additionally, an investigation of this sort regarding a base, which contained a large arsenal of nuclear missiles, would certainly _not_ be broadcast to the public, if only for the simple reason they would not want people to become nervous about the nuclear missiles, or become focused upon the people responsible for them. "In the summer of 2003 a former USAF military policeman at Woodbridge, Kevin Conde, claimed on television and in the press that the Rendlesham Forest UFO case was sparked by a practical joke he staged in his police car to frighten the guard at East Gate. 'It was fertile ground for a practical joke, and practical jokes are a tradition in the security police,' Conde explained." "Firstly, although there is no reason to doubt that Conde pulled the stunt he describes, there is considerable doubt over when it occurred. Conde himself cannot remember the exact date, but from his description of the circumstances, including the weather conditions, it seems that it did not coincide with the Rendlesham UFO sighting. Neither is it established that the guard he was trying to scare was one of those on duty at the time of the UFO sighting." "Conde says that he drove along the Woodbridge runway, whereas the lights reported by the security guards were in the forest. Additionally, Conde was evidently not aware when he made his claim that the sightings stretched over two nights and involved lights that were nowhere near the air base." After negating Conde's role in it, Ian adds that it is not impossible someone else pulled the prank. jc 4/10/2011: First of all, concerning this whole topic, we need to know exactly what the prank was and how it was pulled off. What can be learned from nebulousness? However, once again, the actual denseness of the forest issue previously mentioned by Ridpath and Thurkettle may counter Ridpath's suggestion: While thinking about that relative denseness early in this discussion, it occurred to me that denseness might possibly be prohibitive to driving anyone's patrol car into that area in order to perpetrate said unproven hoax. When you read the testimonies you can notice, the airmen had left _their own_ vehicle before venturing toward and into the forest. Another security policemen had come and stayed at the car as a go-between to facilitate the airmen's ability to radio back. It seems to me it left something to be desired to use people not seeing a particular thing to attempt to disqualify or disprove what others who _were_ ordered by their superiors to be awake and responsible for examining the area said they witnessed. Therefore, I am sure Ian and other serious investigators realize that in order to perform a fair examination of the evidence, the testimonies of as many observers [not non-observers] as possible need to be carefully juxtaposed and examined for congruities, incongruities, etc., to gather as much evidence as possible.
. . . and this leads us directly to . . . . Here again, Ian uses persons who didn't see the UFO to suggest there was no UFO. He tells us when the police came December 26th, they didn't see the UFO. Having already pointed out the fallacy in this logic, we note that Ian is not the first to use someone who didn't see a UFO as proof there was no UFO. I have commented concerning this approach on my website. However it is also noted: Halt says the police never came when he called them regarding his sighting two nights later. Do we have proof of this? Evidently, the quote below provided by Ian appears to confirm this. It leads me to realize it is most likely the police did not perform the kind of analysis that I have presented to you in this electronic paper. The final letter in the Suffolk Constabulary file, dated 28 July 1999, was written by Inspector Mike Topliss to Georgina Bruni, and is reproduced in Bruni’s book You Can’t Tell the People (pp. 135–136 of the hardback edition). Col Halt has spoken of police being called out on the night on which he was involved but not turning up due to an alternative call, and this confirms his story. The police investigation of Rendlesham can be summated as "The police came (Dec. 26th) and didn't see anything, so they tended not to think it important enough to send an officer for Halt's Sighting (Dec. 28th)." Two subsequent visits to the location by police officers. The first visit followed immediately the reported incident, and the two officers who attended made a search of the area with a negative result. [At the times of the officers visiting the incidents] the only lights visible to the officers were those from Orford Light House. Taken from Robert Hastings book "UFOs and Nukes: Extraordinary Encounters at Nuclear Weapons Sites. (© Copyright 2008, Robert L. Hastings - All Rights Reserved). Hastings had referenced the Georgina Bruni book "You Can't Tell The People." I am in the process of obtaining Bruni's book. G. Bruni: "Can you describe the object?" G. Bruni: "Were you alone in the tower?" R. Bobo: "Someone came to the tower and watched it through a scope. I don't know who he was, he was from a different department. I wasn't told anything and I didn't get to look through the scope." G. Bruni: "Could you hear the radio transmissions from your location in the Bentwaters tower?" REF: Bruni, Georgina. 'You Can't Tell the People.' Sidgwick & Jackson, London, 2000, pp. 243-44.
. . . end Bobo's testimony . . .
jc: summation of above testimony"There were several lights and there was this huge ship over the forest" and "I was instructed to watch it." This last comment would indicate Bobo wasn't the only one that thought there was a huge ship over the forest. Ian has suggested that Bobo actually saw stars. In my vernacular, and with the fact Bobo was instructed to watch it, "Huge ship" does not translate to a large star. If it was up there in one place for five hours, does it really make sense to say it was a big star? Also, if Bobo did indeed hear those radio transmissions that night, the items, "radioactive readings," three impressions, and "bumping into trees" is reminiscent of that which was reported during the night Halt and associated personnel had their sighting. (Dec. 28th) Therefore, it would seem at least possible this is when this sighting occurred. “The main object hovered out there for a long, long time [he had previously told Georgina Bruni “it was up there for about five hours, just hovering”]. It never really moved anywhere else. jc question for astronomers re quote #1: The rotation of the earth normally causes all stars to appear to move a generous distance over time. Would Ian’s proposed “star” have stayed in the exact same place or should it have moved if it was actually a star? "Bobo’s account has all the hallmarks of a misidentification of twinkling stars, as outlined above. If this sounds implausible, think how less likely it is that a large, brightly lit alien craft should hover for hours over Suffolk without attracting wider attention." One can also note the following: a) re: quote #3: If it was hard to see, this probably indicates it wasn't so brightly lit. b) re: quote #2: If it wasn't brightly lit and it was extremely late at night (i.e. early in the morning), how many people would have noticed it? jc 6/19/2011: Even if movies were shown, there appears to be too much additional testimony and evidence in this case to attribute the majority of it to fantasies resulting from seeing a movie(s). Is Frearson saying Halt went to see the movies? Does he have proof of this? Interestingly, there has been a thorough study by UFO skeptic Martin S. Kottmeyer which demonstrates movies of this type had little influence on the number of actual UFO sightings in various given years. Ian doesn’t agree with Jenny Randles concerning The Russian Rocket re-entry. b) Ian disputes the fact the NSA on Orford Ness had fired an energy beam into space to “jam the electronics on the Soviet military satellite and deflect its orbital path causing it to burn up in a controlled fashion.” He says “the object that re-entered was not what most people would think of as a ‘real’ satellite. It was in fact the upper stage of the carrier rocket that launched Cosmos 749 over five years earlier, in July 1975. (It is usual for the top stage of a launch rocket to go into orbit with the satellite, and is a major contributor to the amount of ‘junk’ in orbit). As such it was a dead, inert cylinder of metal, and there would have been no way to command it down even if anyone had wanted to do so. What’s more, the re-entry started 1,500 miles away over North Africa.”He gives other reasons on that page. "no one here believes anything strange happened that night" and thinks the flashing light in Rendlesham Forest was the lighthouse. jc: “How many homes in the area is he talking about, and how many people in and around the forest area were actually awake at three in the morning to witness the claimed events?” Most of them were probably sleeping, perhaps including Vince Thurkettle himself. Even if they were awake in their homes, if something was floating silently overhead in a forest at that hour and not brightly lit, it is not likely many, if any, people would have actually noticed it. How many people go out at 3 am? Correspondingly, how many people actually saw the 3 am meteor of which Ian and John Mason have made us aware? Do we have actual pictures of that specific meteor? Why didn't Ian use them on his site? Are we positive what was seen was a meteor? Of course, pictures of that sort would probably be difficult to get, but I'm making the point that if you're not prepared for something and you don't have a really good reason to look up, and it occurs at an odd-ball time, you may not get a picture of it, or for that matter, see it at all. That goes for astronomers as well, unless they happened to be recording the sky in that general spot at that specific instant in time. CohenUFO response: The initial comment turns out to have been a muddled, erroneous reference concerning cattle. From what is written in the article, the error might have been made by the newspaper reporter who did the interview for the News of the World story. However, there is something offensively wrong with both Boast's comment concerning 1) the airmen and 2) the use of same to attempt to prove? the incident wasn't what the witnesses said it was. What the airmen were doing was a mandated, standard part of their job; not to look for UFOs every night but rather, making sure no humans were wandering around doing things they shouldn't. Humans carry lights of various types at night to see what they are doing. It is necessary for the airmen to look for this type intrusion. This base is (was?) a nuclear military institution needing to be guarded. Therefore, the gamekeeper's off-hand anecdotal comment is simply a defamatory statement . . aimed at smearing the characters of the airmen. Ian presented the article without commenting on this. Is he presenting this as scientific evidence? One would hope not. Did its use foster negative innuendo concerning those airmen? . . . of course it did. Boast's comment is obviously unnecessary in anyone's scientific analysis. Innuendo will not solve this case. Ridpath's use of this simply diminishes his scientific thrust and is certainly disrespectful to those individuals. By the way, just for the record, I just re-read the testimonies again and have not seen any references to cows or cattle by the airmen. Anyone taking the time to read the testimonies in this critique carefully can discover this for themselves. It would seem, Ridpath did not. He might say this was not his purpose in presenting the article. My thought is . . . why present this (data?) in the first place? "Many people think the Rendlesham story is a nonsense that was debunked out of existence. One might even be tempted to argue that if a UFO case like Rendlesham falls, then none is safe . . . That, of course, is exactly why the UFO community dare not let Rendlesham fall." jc: Although I respect a lot of what Ian has accomplished, I am rather disappointed that he chose to include the above quotation by Jenny Randles in his "scientific?" appraisal of this case; especially its concluding sentence. One may wonder why Ian chose this particular quotation to use in his piece on Rendlesham as it is not only improper in that context, but an insult to all those of us that have been performing honest investigation into UFO cases for years. Jenny is such an artist and her paint brush so wide in this instance, she is able to paint an entire community as dishonest with one foul stroke. Her comment simply displays both a lack of respect for others sincere efforts and her own lack of personal knowledge concerning the solidity of a number of thoroughly-investigated, impressive cases (in some instances investigated by three or more separate investigational groups, scientists, etc.) The existence of these certified events renders what she has suggested totally moot. Her generalization is just that . . . a _generalization_ (one of a number she tends to make), and does little to help researchers get to the truth concerning the UFO mystery as a whole. It should be obvious to most of us that generalizations without specifics to back them up don't really contribute much of value when one is searching for a definitive solution regarding either a singular UFO case or the phenomenon as a whole. Unfortunately, Ian's use of this particular quote, once again, only serves to further diminish the scientific impact of his own arguments and aligns him with that negative facet of Jenny already mentioned above. I would hope well-educated and informed readers would realize a number of us in the UFO community, on both sides of the ufological fence, are owed an apology. Those of us having spent years performing legitimate analyses and seriously searching for truthful, rational explanations for various cases, have virtually no reason to do what Randles (and Ridpath) have suggested. jc) If he is correct, Ian has informed us even Jenny believes something unusual happened at Rendlesham. Perhaps the information found within this essay will offer some clues, at least in part, as to why she has (or had?) felt this way. "For Vince Thurkettle, the only mystery remaining is why UFO researchers, in two and a half years of investigation, failed to spot this most obvious of explanations." jc) Since the majority of the material used in the analysis I have performed was acquired directly from Ian's own website, and noting the data extracted from same, it would seem one might be tempted to reiterate this exact statement to both Vince and Ian, while necessarily upgrading the time factor to thirty years. However, perhaps two of the most important lessons to be learned here are that the obviousness of some explanations may actually, not so simply, lie in the eye of the investigator, and . . . we all owe each other some honest respect for the research all of us are performing. A couple of observed coincidences: Those of you that have gotten this far reading this and think that I have done a proper job analyzing this case and Ian Ridpath's appraisal of same, may also be interested in the following three cases. What is seen in each has a number of similarities to the 1980 Rendlesham sightings. The separate red/orange light described by the security guard was reminiscent of a light that was testified to as detaching itself from larger objects in two other thoroughly detailed, well-investigated, military cases; Belgium 1990, and Iran 1986. One can view a video of Parviz Jafari's testimony concerning the Iranian sighting made at a 2007 Washington Press Club conference by clicking the preceding URL. (His speech located at 23.10 on the You Tube control.) Note the colors Jafari describes, then note the colors Halt described concerning his "star-like" objects above. A more detailed account of Parviz encounter can be found in Leslie Kean's excellent book, "UFOs", Chapter 9, p 86, Copyright 2010, Harmony Books / NY. Leslie was with these people at the conference and has documented it all for us. 6/11/2012: Incident at Exeter, John G. Fuller, Berklee Medallion Books, Paperback, Copyright 1966, pp 15/16 - This description was given in an AP dispatch from The New York Times of August , 1965. . dateline Oklahoma City. Note the descriptions and then juxtapose with witness descriptions (colors, exploding in shower of sparks, etc.) given in the 1980 Rendlesham case. "AP dispatch from The New York Times of August 3, 1965 . . . The dateline was Oklahoma City:"
"Authorities in Texas, New Mexico, Oklahoma and Kansas were deluged last night and early today by reports of unidentified objects seen flying in the sky." "The Sedgwick County sheriff's office at Wichita, Kansas, said the Weather Bureau had tracked 'several of them at altitudes of 6,000 to 9,000 feet.' "
"The Oklahoma Highway Patrol said police officers in three different patrol cars had reported watching the objects fly in a diamond-shaped formation for about 30 minutes in the Shawnee area. The patrol said the officers had described the objects as changing in color from red to white to blue-green." "I was a disbeliever, but I saw something up there tonight, and so did other observers at the Weather Bureau." "They were red and exploded in a shower of sparks and at other times, floated like a leaf." "You could see it with the naked eye. It looked like it was on the ground or hovering just above the ground. It was red, greenish, blue and yellowish white, about 100 yards long and egg-shaped." UFO Hunters - Code Red Here is yet another, totally pertinent to this 1980 Rendlesham case. It's scenario is similar to Rendlesham, although the UFOs seen at the time were also seen on radar. I just watched UFO Hunters case #65102 Code Red. It concerns a case that occurred at Edwards Air Force Base Oct. 7, 1965 . . . two years before my own personal sighting. A sincere thank-you to Sam Sherman, Bill Birnes and UFO Magazine for the major effort that went into obtaining and providing the public with this information. If the above cases have peaked your interest, take a look at this next group which occurred approximately five months later. One of them involved college students, police, a civil-defense director, and J. Allen Hynek, USAF's civilian astronomical consultant. The police report was kindly sent to me in 2005 by Dr. Harry Willnus, a prime investigator of same. It encompasses a small portion of his inquiry into several 1966 Michigan incidents and demonstrates what was seen was not swamp gas. Additionally, important scientific evidence negating Hynek's proposed solution at that time was provided by William Van Horn, civil defense director. Furthermore, Dr. Willnus also discovered, what appears to be, an excellent reason for Hynek's chosen solution. Please note the colors of the observed objects, and police descriptions of maneuvers performed. Ask yourself if it sounds like any stars or planes you've ever seen. As promised at the outset of this critique, here is the present YouTube address of the National Press Club conference in Washington DC, November 12, 2007. Although long, it is certainly worth every second of everyone's attention. Are these individuals all hallucinating or misidentifying? A number of them have quite impressive credentials. It is now not so easy to mentally dismiss Rendlesham from this group.